The chapter presents the importance of interdisciplinary projects for modern engineer education. 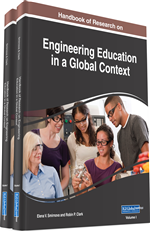 The components of the educational process influencing the quality of engineer education are allocated. The importance of the “learning through research” principle is noted. Examples of projects centered on the creation of information-analytical systems in various subject domains, and also, professional tasks which were solved by students are given. The conclusion is drawn that experience in the development of systems in one area can effectively be used in the development of systems in another area. The features of the project centered on the creation of a remote monitoring system of the human state, and the protection of the transferred physiological data are considered. The quality of engineer learning depends on many components directly related to the organization of the educational process (Ryneveld, 2016). The most important ones among them are: the use of modern forms and methods of learning based on information technology; high-quality software and information support of the educational process; integration of the scientific and educational activities of students; widespread introduction of the results of scientific research into the educational process; and practical orientation of the graduation projects (Sinicyna, Kurdyukova, & Abramova, 2013). These components are most effective when using active forms of learning; for example, ones based on the project approach (Knoll, 1997). The application of the project method of teaching has a long history. It appeared in the first 20-30 years of the 19th century in the USA and was based on the principle of “Learning-by-doing” (Dewey, 2009) (Kilpatrick, 1918). At present, the methods of project-based learning are the subject of many publications. For engineering education, the fundamental ideas (Hall, 1962) that were described over half-a-century ago have remained relevant. The project approach is also widely applied in the industry when developing new equipment and techniques. Therefore, it is logical to acquaint students with the main ideas of the project approach at the implementation of not only educational, but also real-world, projects. The Internet and modern information technologies provide quick access to a huge amount of diverse information (Proletarskij & Neusypin, 2014). In Aleksandrov et al.’s work (Aleksandrov, Proletarskij, Neusypin, & Sharkov, 2012), features of innovative information technologies are highlighted for application in education. In particular, it becomes possible to set simple but real-world project tasks and to find their solutions in a short time. Although the obtained solutions may not always be correct, the process of obtaining them – in terms of learning – is effective. In modern engineering education, the combination of the project approach with innovative information technologies is most effective when implementing the “Learning-through-Research” principle (Fedorov, Norenkov, & Korshunov, 2006). It involves engaging students in scientific research and development work. At the same time, researches of interdisciplinary character are of great importance. Moreover, in terms of modern technological development, interdisciplinarity is the key factor. It should be noted that in this case, unlike in the classical project method, students not only use the knowledge they have gained, but they also acquire new competencies—which increases their qualifications. In the process of implementing interdisciplinary projects the students acquire skills of joint collective work on projects and competencies related to searching the solutions of professional interdisciplinary tasks. The proposed approach complements the traditional forms of education. First of all, it is aimed at students who wish to acquire additional competencies. Similar situations arise with the target preparation of specialists, early employment, etc. In this chapter, the examples of projects involving the creation of information-analytical systems for various purposes, and the problems solved by students during the implementation of those systems, are given. The professional knowledge gained during the work on such projects helps future engineers to design, develop, and implement information-analytical systems; to perform their operations and upgrade; to conduct experimental research of information processes; and to make informed management decisions. Information-Analytical Systems: Automated systems which carry out the storage, processing, analysis, and provision of information in a user-friendly form. Active Forms of Learning: The methods that stimulate cognitive activity of students in the process of mastering the educational material. Biosignals: Signals recorded by sensors located on the human body (ECG, sphygmogram, pneumotachogram, phonogram, etc.). Scientific Research: The systematic collection and analysis of data to obtain new knowledge. Interdisciplinarity: The combining of two or more academic disciplines into one activity (e.g., a research project). Learning Through Research: The principle of learning in which the basic knowledge is acquired by students themselves during research activities. Remote Monitoring: The assessment of an object’s state at a distance. Information Security: The process of ensuring the confidentiality, integrity, and accessibility of information.